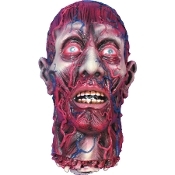 Walking Dead Inspired Gruesome Severed Cut-Off Human Skull Body Part with partial Neck Skinned Alive! Disturbing dismembered de-fleshed skull faux head. Large life-size... no longer living creature of the undead. Made of foam-filled latex rubber and realistic painted features. Approx 13-inch (32.5cm) high x 6-inch (15cm) wide x 9-inch (22.5cm) long.